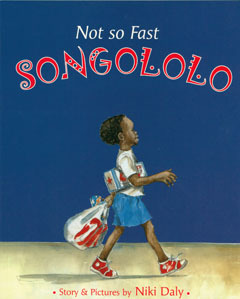 Not So Fast Songololo is a touching tale of young and old, full of the colours and smells of an African township. Songololo goes into the city with Gogo to help her do the shopping. Gogo walks very slowly, but Songololo likes to take his time as well. Grandmother and grandson enjoy a leisurely stroll around the busy African city, ending with a special reward for Songololo, for helping Gogo so well. sometimes need to be more thoughtful around the elderly. Not So Fast Songololo by Niki Daly is available to buy now.